I know my blog is supposed to feature books, but I'll count this post in the "occasionally other things" part of the description. I just have to share my excitement about what arrived in my mailbox yesterday -- my first issue of Food Network Magazine! A few weeks ago, an offer for magazine deals appeared in my email; and I couldn't resist ordering Food Network Magazine for $5 for one year. Oh boy, am I glad I did! I am not even done reading through the entire issue, and I already love it! Maybe my excitement has something to do with the fact that I'm dieting and can't eat much right now, but I really don't think so -- there are just so many interesting features and yummy recipes! Now I admit that I don't really watch the Food Network, but I am familiar with most of the chefs. I don't think my lack of interest in the television shows affects my appreciation of this magazine. I think there is a little something for everyone including tons of recipes (126 in this issue alone), 10 Things You Need to Know This Month which features interesting little tidbits about food stuff in general, behind-the-scenes looks at the television shows, and step-by-step pictured instructions of some of the more challenging recipes. 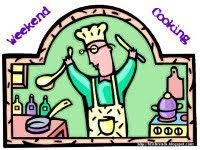 And the kicker for me is that there are just tons and tons of beautiful, colored pictures of the recipes! There are so many wonderful recipes in this issue from healthy dinners, to party food, to cute desserts. Of course, the healthy dinners section is what I will probably use the most because we do try to eat relatively healthy even when I'm not doing the Game On! diet. I have already marked a few recipes to try -- some might even work for me while I'm on this diet. In addition, I thought the section called "I Want Candy!" was precious. There are quite a few cupcake recipes that mimic your favorite candy bars like Snickers, Peppermint Patties, Reese's Peanut Butter Cups, and Almond Joys. I can't even tell you how yummy the cupcakes look -- plus they seem to be pretty easy to make! I am just thrilled with the Food Network Magazine and I'm hoping they are all this good! Please let me know if you are familiar with this magazine and what you think about it. This definitely looks like something I need to investigate. Thanks so much (I think) for letting me know about it. I didn't know about this magazine, either, but I bet Carl would love it. He loves the Food Network. My husband and I have a subscription to this magazine, and we love it! I've seen this magazine on the newstand and it's caught my eye. I'm going to have to look for that $5 deal! I always ignore those emails. 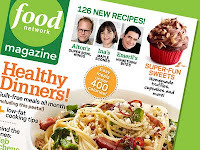 If you like this magazine I bet you'd love Food Network! I love foodie shows and Top Chef is a favorite pf mine on Bravo. My mom and I have been buying this magazine for a while now and we love it. All of the ones we've had have been good and have awesome recipes! I wish we'd get a $5 deal out this way. This really is a great magazine! I love my subscription too. I have to admit though that I cooked Ina's butternut squash soup...and didn't like it! It was too sweet and think I'd leave the apple out next time. Interesting eh? I did save it though and will use it as part of the base for my low-fat mac and cheese recipe, so it's still a win/win, right? Well, have fun! I've been getting this magazine since its beginning. I love it and didn't renew my Rachel Ray mag because I liked this one more. I can't wait to go through it as soon as it comes in the mail! This, along with Real Simple and Rachael Ray, is in my top three magazines. It's so visually appealing and full of great tips/information and recipes. I didn't know Food Network had a magazine. I used to watch their shows while I was on the treadmill (I know, kind of cross purposes), before I started listening to audio books. I hope you tell us more as you try some of the recipes. The Reagan Arthur Challenge -- Are You In? Kid Konnection - Review: The Grasshopper Hopped!